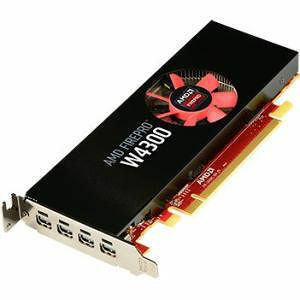 The AMD FirePro™ W4300 is AMD's highest performing professional graphics card for CAD that fits in both small and full-size workstations, offering unprecedented flexibility in its class. The AMD FirePro™ professional graphics product family is certified on more than 100 different applications for improved performance and reliability, including the most popular design and engineering and media and entertainment applications. Helps to improve overall workstation speed and responsiveness, and application performance. Load large assemblies, models and data sets, or advanced visual effects, and manipulate them with ease. DirectGMA bypasses any need to traverse the host's main memory, reducing CPU utilization, and avoids redundant transfers over the PCIe® interface, resulting in high throughput, low latency data transfers. A multidisplay technology enabling highly immersive and powerful multitasking experience across up to four displays, powered by a single AMD FirePro™ W4300 graphics card. Tap into the parallel computing power of modern GPUs and multicore CPUs to accelerate compute-intensive tasks in leading CAD/CAM/CAE and media and entertainment applications that support OpenCL. AMD FirePro™ W4300 supports OpenCL 1.2 and is expected to support OpenCL 2.0, allowing developers to take advantage of new features that give GPUs more freedom to do the work they are designed to do. Helps speed up time required to complete single precision operations used within Video Enhancement, Signal Processing, Video Transcoding and Digital Rendering applications.